Another new feature in Windows 7 is the image backup, which is essentially a snapshot of all the settings and files on your hard drive. You can restore the image backup in Windows 7 to bring everything back to the way it was in the event of a calamitous crash. This means that you won’t have to reinstall everything, you won’t have to customize your settings, nothing. Just run the Image Restore program and you’re good to go. Unlike the other backup methods, restoring a system image backup obliterates everything on your hard drive, replacing the whole works with the saved copy. Windows 7 users should employ this tool only in dire circumstances, such as when malware has completely taken over your system. To restore a full-disk ghost backup, you must have either of the following two items: an original Windows 7 installation DVD or a system repair disc. You must have created a full backup at some point, and your computer has to be able to boot from the DVD or CD. If you have a system repair disc, reboot with the System Repair Disc in place. If you don’t have a system repair disc but you have a Windows 7 Installation disc, boot from that disc, select your language preference, and then click Repair Your Computer. In the next dialog box, select Microsoft Windows 7 and then click Next. In either case, you see the System Recovery Options dialog box. 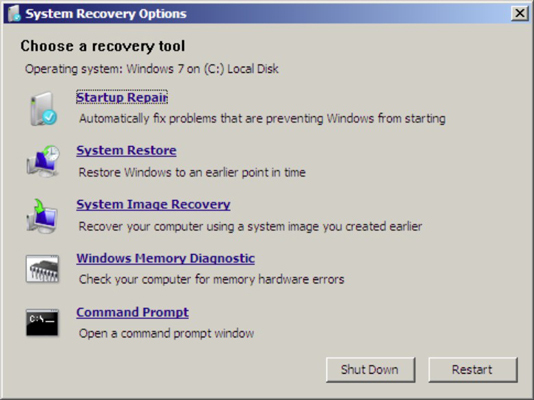 If you bought Windows 7 preinstalled on a PC, the System Recovery Options may have been changed by the manufacturer. If you don’t have a system repair disc or a genuine Windows 7 Installation disc, you’ll have to follow the manufacturer’s directions. Click the System Image Recovery link. Windows 7 System Recovery shows you the Re-Image Your Computer Wizard. If the wizard finds the backup you want to use, select Use the Latest Available System Image. Then click Next and proceed to Step 6. If you backed up your drive to another computer on the network, click Cancel and then select Restore a Different System Image. Click Next. The wizard asks you to select the location of the backup. If necessary, click the Advanced button and follow the instructions to find the backup location you want to use and click Next. After you choose a location, you’ll need to choose an image backup. Choose the backup you want to restore and click Next. You can choose to reformat and repartition your hard drives at this point. Confirm that you have the right restore point and then click Finish. The wizard churns away for as long as it takes — sometimes hours — and reboots the computer as soon as it’s done.